Every once in a while we come across an item that is not only worth mentioning but is worth buying. An 11-year-old girl came up with the idea of a kangaroo cup to help her grandfather who had Parkinson’s disease. It was difficult for him not to spill his drinks. Consequently, she made a special cup to just for him. Now he no longer spilled every drink. Her new invention helped to alleviate the problem. A new kind of cup from a new company, Imagiroo. The cup is called the kangaroo cup. It is a bit pricey but worth every cent. How many times have you too had a drink, put it on the counter, and them promptly spilled it? Sometimes I feel like a small child. I only placed my cup on the counter. As I was moving about the kitchen I knocked it over and then there it went! I did not mean to but we never do. And I was so much looking forward to that last drop. Sometimes I think I need a sippy cup. I bought quite a few of them when my children were small. Last week I ordered some for my daughter’s son. He never seems to spill his drink. I do not intend to tell my girls that I have all these kangaroo cups just to keep me from making a mess. They will think the cup is different and rather neat. It is also comfortable. Everyone has that favorite cup. This one feels good in my hands and now it is my favorite. I have a cupboard of them. 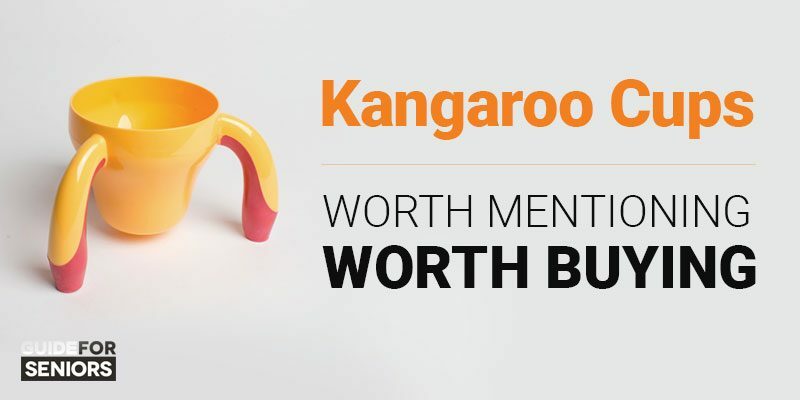 The Kangaroo Cup has 3 legs on it rather than just a handle. When it is placed on a counter, it is much more difficult to spill. The 3 legs help to keep it balanced. Those very same legs are the handles on the cup. I do not have Parkinson’s but as a senior, I am not as steady as I used to be. This cup has saved me many times. It is much more difficult for me to spill any drink. I savor my tea and enjoy my coffee so much more. It is truly a worthy invention. Wish I had thought of it! Takes a child! You can buy one at Amazon.com.